For the fourth year, SWOG Cancer Research Network and its charity, The Hope Foundation for Cancer Research, are giving military veterans better access to cancer clinical trials by providing grant support to U.S. Department of Veterans Affairs medical centers. Under the VA Integration Support Program, medical centers receive a one-time $50,000 grant to help them enroll veterans in trials run by SWOG and other members of the National Cancer Institute's National Clinical Trials Network (NCTN). This means more veterans get targeted treatments, immunotherapies, and other cutting-edge medicines tested in cancer trials. The NCTN offers dozens of trials for a variety of cancers, including lung, prostate, and colorectal cancers – the most common forms in veterans. Giving veterans better access to clinical trials is a priority of the National Cancer Institute, the primary source of funding for SWOG trials. This year, for the first time, the NCI and the VA's Office of Research and Development provided infrastructure grants to 12 VA medical centers that want to increase participation in NCI trials. The program, the NCI and VA Interagency Group to Accelerate Trails Enrollment (NAVIGATE), is aimed at creating a sustainable national network of sites that offer veterans new cancer treatment options through clinical trials. "Our program, and the NCI program, are complementary," said Charles D. Blanke, MD, SWOG group chair. "Both have a goal of getting more veterans into trials, and both provide infrastructure support in an effort to meet that goal. It may take years, but I believe that together, SWOG, Hope, and the NCI will make a positive difference for these centers and the veterans they serve." Offering clinical trials to patients is considered best practice among cancer physicians, because trials offer access to treatments otherwise unavailable. But offering cancer trials is time-intensive and expensive, requiring hospitals to have adequate staff to work with patients before, during, and after their treatment on a trial. Through the VA Integration Support Centers Program, centers use the grants to fund clinical research associates and oncology nurses, the support staff who discuss trials with patients, assist with paperwork, submit tissue samples, record treatment and safety data, and perform other tasks necessary to run safe and effective clinical studies. 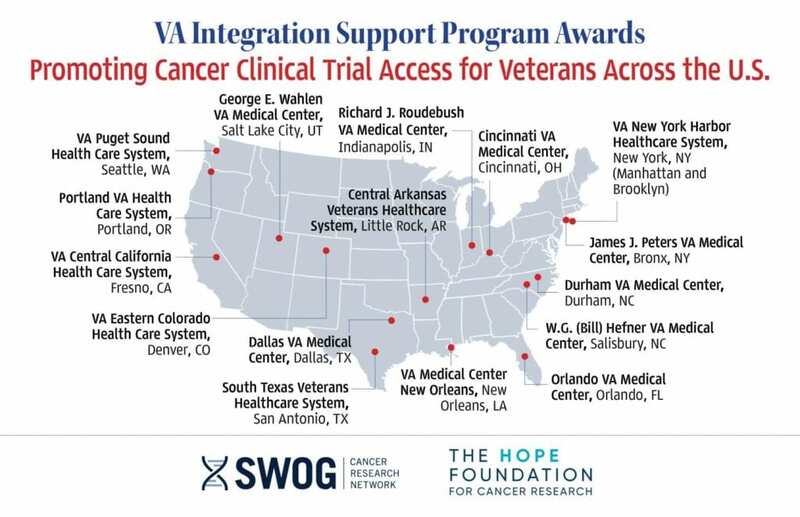 Since the SWOG and Hope VA Integration Support Program began in 2015, statistics from NCI's Clinical Trials Reporting Program show that at these 14 VA centers, 65 veterans have registered to SWOG and other NCI treatment and prevention trials. In 2014, before the program was launched, nine veterans at these 14 centers enrolled on NCI trials. So far in 2018, 23 veterans at these centers have enrolled. That's more than double the registrations to NCI trials.